The human body has an Endocannabinoid System (ECS) that receives and translates signals from cannabinoids. It produces some cannabinoids of its own, which are called endocannabinoids. The ECS helps to regulate functions such as sleep, immune-system responses, and pain. With receptors spread throughout the brain and body. 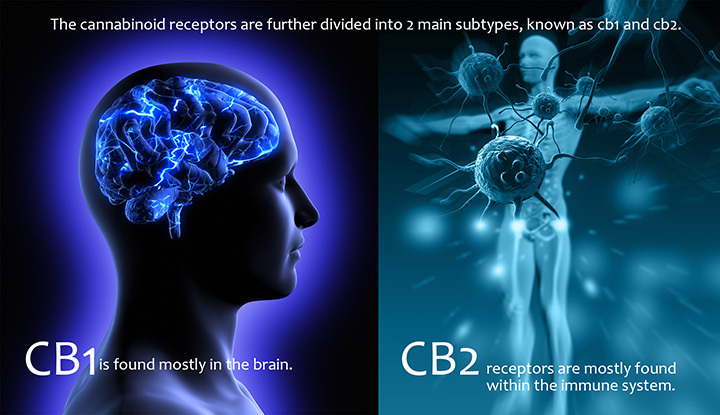 THC activates the CB1 and CB2 receptors, while CBD does not directly stimulate these receptors. The CB1 and CB2 receptors CB1 receptors are found mostly in the central nervous system, and in smaller numbers in the liver, kidneys and lungs, while CB2 receptors are part of the immune system and found in the hematopoietic blood cells as well. CB1 play a role in the production and release of neurotransmitters, cannabis products that exert psychoactive effects stimulating these receptors. At the same time, CB1 receptors are involved in the lipogenesis process that takes place inside the liver, and seem to play a role in the maintenance of homeostasis (body’s internal equilibrium). Various studies suggest that CB1 also influence pleasure, concentration and appetite, memory and pain tolerance CB2 receptors on the other hand affect the immune system, being involved in a variety of functions like immune suppression or apoptosis (programmed cell death). Studies suggest that CB2 modulate the pain sensation and could play a role in various diseases, from liver and kidney problems to neurodegenerative diseases. CBD does not stimulate these two receptors; instead, it activates other receptors, like the vanilloid, adenosine and serotonin receptors. By activating the TRPV-1 receptor for example, cannabidiol plays a role in the mediation of body temperature, pain perception and inflammation. Then, CBD inhibits the FAAH enzyme, a compound that activates the CB1 receptor. By doing so, CBD minimizes the activation of CB1 by THC, reducing its psychoactive effects. High concentrations of CBD have been shown to activate the 5-HT1A serotonin receptor, exerting anti-depressant effects. The same receptor is involved in a series of processes from pain perception, appetite, nausea and anxiety to sleep and addiction mechanisms. Finally, CBD blocks CPR55 signaling, decreasing bone re-absorption and cancer cell proliferation. GPR55 is widely present inside the brain, being linked with the modulation of bone density and blood pressure, as well as with cancer cell proliferation. As previously said, CBD blocks the psychoactive action of THC, this being one of the reasons it’s generally considered advantageous to combine CBD and THC when for treatment purposes. However, the positive effects of cannabidiol are not dependent on the presence of THC, so you can still take advantage of the health benefits of CBD by purchasing products that contain only non-psychoactive CBD. Mechoulam, R., and Hanus, L (2000, November). A historical overview of chemical research on cannabinoids. Chemistry and Physics of Lipids, 108(1-2), 1-13. Retrieved fromhttp://www.sciencedirect.com/science/article/pii/S0009308400001845. Pertwee, R.G. (2006). Cannabinoid pharmacology: the first 66 years. British Journal of Pharmacology, 147(Suppl 1), S163-S171. Retrieved fromhttps://www.ncbi.nlm.nih.gov/pmc/articles/PMC1760722. Wood, T.B., Spivey, W.T.N., and Easterfield, T.H. (1896). XL. – Charas. The resin of Indian hemp. Journal of the Chemical Society, Transactions, 69, 539-546. Retrieved fromhttp://pubs.rsc.org/en/content/articlelanding/1896/ct/ct8966900539#!divAbstract. I tried CBD about a week ago and I have never slept better.